With over 25 years of practical experience in buying and selling in the international art market, the Art Resource Group has the knowledge to provide our clients with an accurate inventory, history and estimate of value. 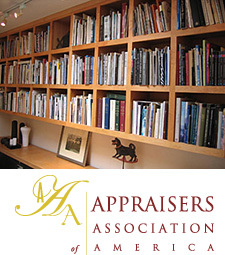 As a Member of the Appraisers Association of America for the past 8 years, Ms. Smith specializes in valuing American and European art from the 19th and 20th centuries, and can provide evaluations for most works of art in her area of expertise. We are available one day each week for brief consultations to inspect works of art. We charge for our time in 20 minute increments. Formal written appraisal reports are prepared for a multitude of purposes which are listed below. All appraisals are prepared to the code of the Uniform Standard of Professional Appraisers Practice and are strictly confidential. Our research library consists of important monographs and catalogue raisonnés and reference volumes not readily available to others. Our appraisal services are referred by past clients, galleries and museums, including the Laguna Beach Art Museum and the Orange County Museum of Art. Please contact us to discuss your appraisal needs or to schedule an appointment. We also recommend that insurance appraisal be updated every 3-5 years to reflect current market replacement values.